While prices of Big Island homes and condominiums recently jumped an unheard-of 40 percent to 70 percent, there are signs the market might be starting to level off. The number of single-family home sales declined on the Big Island in August as did condominium sales. A lack of available homes and high prices could have discouraged some buyers from participating in the hot market, said Helene Tajiri, a real estate agent with Hilo-based Ala Kai Realty Inc., which has operated on the Big Island for the past 35 years. "The market rolls so fast and goes so high," Tajiri said. "I do see the market flattening and I think it has started correcting itself." Single-family home sales on the Big Island fell 3.1 percent to 251 in August from the year-before 259, according to data released yesterday by the Hawaii Information Service. Condominium sales declined 17 percent to 78 units from the previous August's 94. Still, year-over-year price gains on the Big Island are "unbelievable," Tajiri said. In August, more than half the single-family homes sold for greater than $440,450, a 49 percent gain from a year earlier. The $424,900 median condo price during the month was 70 percent higher than a year earlier. "We're all saying wow to these prices," Tajiri said. "No one knows how high they could go." 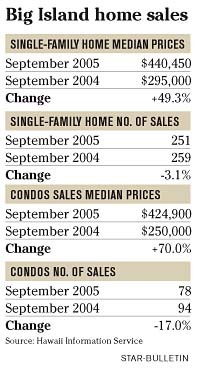 In September, the median sales price for a single-family home increased 43 percent to $427,500 from September 2004. The median price of a Big Island condominium hit $432,500 last month -- actually topping the median price for a house -- a 40 percent year-over-year increase. Total sales volume of Big Island houses was flat in September, while the pace of condominium sales picked up. Monthly fluctuations between the prices are starting to show some decline, Tajiri said. As sales have declined in some neighborhoods, owners have been more willing to drop their prices. Strong price jumps on the Big Island have made lower-priced Hilo, Puna and Kau attractive to buyers, Tajiri said. "We've got buyers coming from everywhere," she said. "A lot of them prefer the Kona side, but the prices have gotten so out of reach." Interest in Hilo and Puna has spurred land sales, single-family development and speculative construction, Tajiri said. It's also brought about incredible price jumps in these neighborhoods. "Vacant land that we used to sell for $20,000 in Puna is now selling for $100,000 an acre," Tajiri said. "We're catching up to prices on the other islands."